This week we’re showcasing an all-ages fantasy story about a girl searching for her twin sister. Published by Blue Fox Comics, I spoke with the full creative team, including the writer, artist, graphic designer and composer (who created a special story soundtrack for the book). 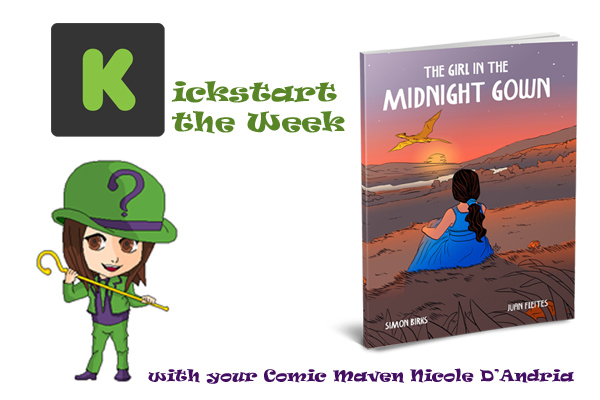 The Girl in the Midnight Gown is an 80 page graphic novel about Lela, a young girl who is looking for her twin sister Darby. She gets help from Sarah, the girl in the midnight gown, and explores a magical fairytale world. During her travels she discovers Abe’s, a barbershop that is thousands of years old and serves heroes. But this is just one place in the fantastical world of Faerie. 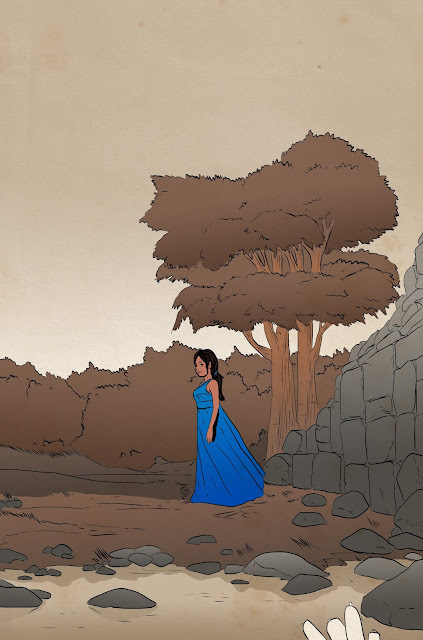 When the project reaches certain percentages of funding, pages from "The Unfinished Story" illustrated tale will be unlocked, which is the second story of The Girl in the Midnight Dress. It will not be a traditional graphic novel but a throwback to illustrated books like Winnie-the-Pooh. This is the first story set in a new fantasy universe created by Simon Birks. 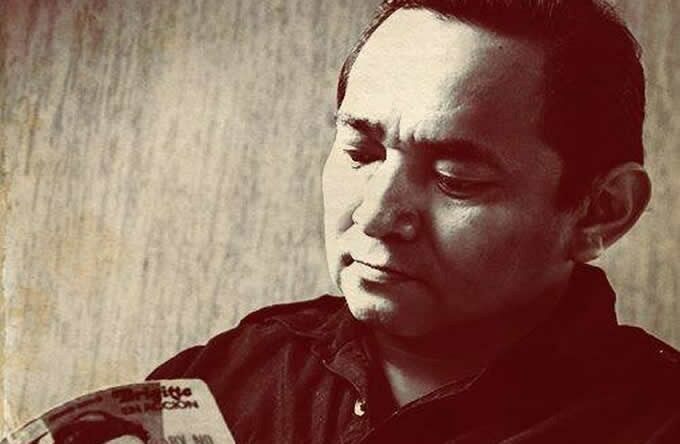 Besides comics he also writes plays, poetry and award-winning films. 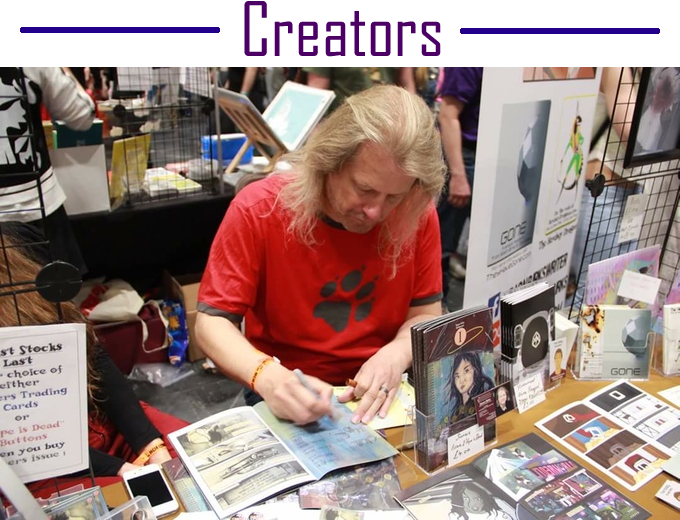 Birks is also the co-founder of Blue Fox Comics. The graphic novel is illustrated by Juan Fleites, who has worked in the comic industry for 12 years. 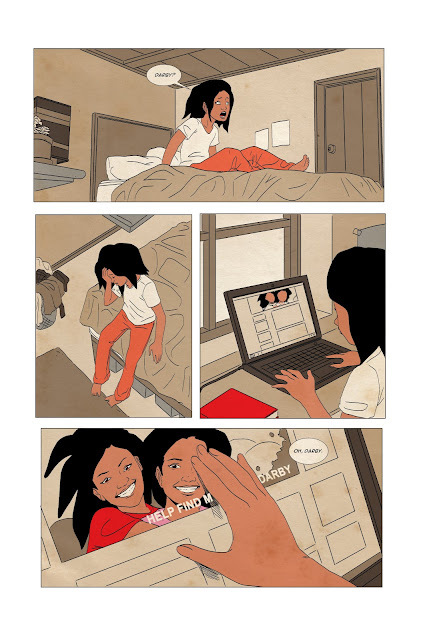 Lyndon White did some graphic design on the illustrated story. The project’s goal is to reach $9,459 (converted from a £7,200 goal) by August 31, 2017 at 6:59 PM EDT. Rewards include a bare bones PDF of the comic (£5/$6.52), a deluxe PDF (£9/$11.74), a softcover copy of the graphic novel with an exclusive bookmark (£19/$24.78), plus two dragon enamel and the exclusive story soundtrack (£25/$32.60), among other rewards like hardcovers, T-shirts and exclusive prints. You can pledge money to their Kickstarter here. Me: You mention that part of your inspiration for the story came from shopping for new books with your young daughter and not finding much that was age appropriate for her. What about your story will appeal to young girls in particular? 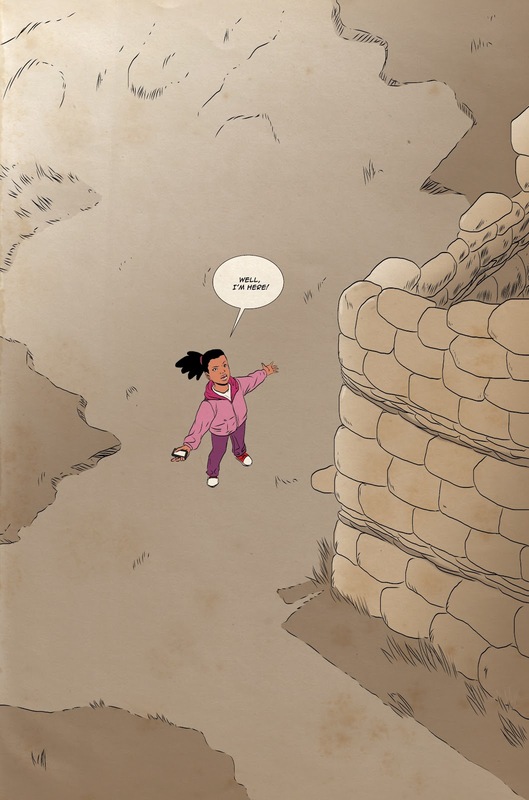 Simon Birks: It's a story that has a young girl at its very center. Lela is desperate to find her missing sister, and is ready to face any challenge to get her back. As we venture further into the story, Sarah, the girl in the midnight gown, offers to help her. We also have many of the heroes’ depicted being both male and female, with no restrictions on gender whatsoever. Me: How would you describe the main and supporting characters in The Girl in the Midnight Gown using one sentence per character? Birks: Lela is the best sister you could hope for. Darby is a girl who loves getting lost in a story. Sarah is a person who isn't what she seems. Abe is the amiable barber to heroes throughout the ages. Me: How would you describe the fantasy world in this graphic novel and how does it differ from other fantasy worlds in comics? Birks: We're in Faerie, a place where every story can happen at once. With Abe's, we also can cross time; a hero can enter Abe's at any moment, and talk to other heroes from other times. All the heroes know each other, and are happy to help whenever the need arises. 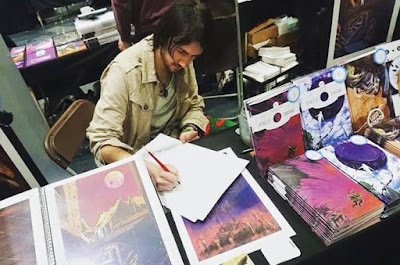 Me: Something very unique about your comic is that you have music that was specifically composed for it. Why did you make the decision to add music and how do you feel that adds to the story? Birks: We also make films, and one of my favourite parts is hearing the soundtrack. There's something very magical when you hear this brand-new music work with the visuals. I realised this was something not just confined to film, and that we could create a unique experience for the readers to really become part of the story. I'm really pleased with Paige's soundtrack, and can't wait to start sending it out to everyone! Me: Are you planning on creating more stories set in this fantasy world, and if you are, will they follow Lela and her sister or new characters? Birks: Yes! We're planning many more stories in this fantasy world, using some of the heroes you find in the book. The other stories won't necessarily have Lela and Darby in them, but they may show up from time to time! Me: For early backers, you arranged a comic book bundle. Why did you pick the books that you did to be in that bundle? Did any of them have an influence over your own writing for The Girl in the Midnight Gown or in general? Birks: The books I chose were from friends and colleagues who I've gotten to know over the last few years. I've got the books myself, and whilst none of them had direct influence over the story, I can vouch for their great stories and readability. Me: As a co-founder of Blue Fox Comics, the company that will be publishing this comic, what is your publisher’s mission statement and how is that mission statement furthered by The Girl in the Midnight Gown? Birks: Mission statement? Good question. We produce great stories, with unique artists, in strong genres. Up till now, we haven't had a fairy-tale story, so this widens our growing appeal. Birks: To get a great story, with a diverse range of characters, and a strong female lead. Birks: Create great characters, and then get people to care about them. Me: What was your favorite page to draw in The Girl in the Midnight Gown and why? 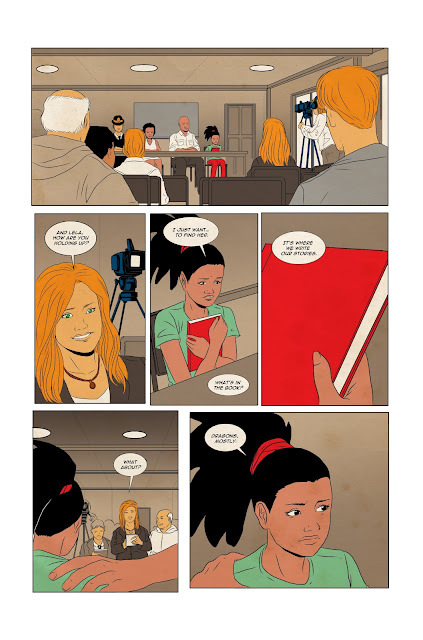 Juan Fleites: The page when Lela enters Abe's the first time because she looks at many people of different ages taking a break. Fleites: The dragons, I never work on a project with dragons; this make drawing a good time and I hope the reader likes the dragons in this story. I make three kinds of dragons: European, Chinese and Mayan. Fleites: I wanted to work on these kinds of stories with fantasy elements and real people, what in my country they call: magical realism. Fleites: They have the guarantee that we are serious people working hard on projects. Fleites: The art is intuited with thought and is realized with knowledge. No magic formula or secret more than practice every day, study, build a technique and be very disciplined. After all, this is a job. Paige Lehnert: I first met Simon Birks when we both worked on the award-winning film The Search for Simon together several years ago. Ever since then, he asked me to collaborate on several of his Kickstarter campaigns. Usually I score the trailers for his graphic novels, but this time I was overjoyed that he asked me to also make a companion soundtrack to The Girl in the Midnight Gown! Me: When making the various tracks, how would you describe the process of deciding what kind of melody to create that would fit with the comic? Lehnert: When I first read through The Girl in the Midnight Gown, my head was spinning with ideas about what each scene would sound like. So, with the comic up on my computer screen, I started fleshing these ideas out on the piano using the images as a guide. Whatever the art and dialogue made me feel went right into those notes! Once I had the basic melodies down, I chose specific instruments to highlight certain characters. For example, the celesta is featured prominently in pieces like “The Nightmare,” “Here Be Dragons” and again briefly in “Darby Found” and “The Unfinished Story.” I liked the sound of the celesta because it has that sort of mysterious fantasy fairyland feel to it, and that was the feeling I wanted to convey every time the girl in the midnight gown made an appearance (however brief). “Darby Found” and “The Unfinished Story” features the theme for Lela, Darby and their mum and dad. This theme is mostly orchestral, comprised of strings, piano and flute, with celesta (and even the zither!) making an appearance but taking a much more understated role. I wanted the more emotional elements of the family’s relationship to take center stage in these two pieces. The last two tracks, “Abe’s” and “Happily Ever After,” were two fun Celtic pieces that I composed for the scenes that took place at Abe’s. Despite these scenes taking place in a barbershop, they always had this feeling of a “tavern” to me, so I wrote to that. Me: If you had to pick one, what is your favorite track that you did for The Girl in the Midnight Gown and why is it your favorite? Lehnert: My favorite track is called “Abe’s.” It’s a Celtic-inspired tune that plays when the main character, Lela, visits the mysterious barbershop that is home to a host of adventurers and legendary heroes. It was the most fun to create because I got to play with several folk instruments (some of which I’d never touched before in any other project). There’s an Irish fiddle for the main line, and then I used a bodhran, zither, flute, guitar and soprano recorder. I really had a great time working on this specific piece! 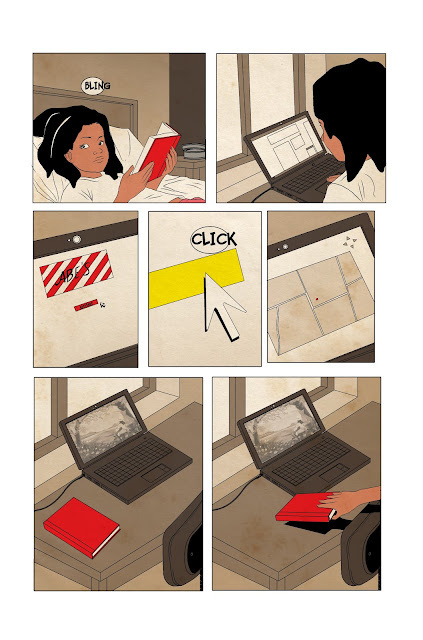 Lehnert: There is a surprising lack of graphic novels that are suitable for all ages today. The fact that The Girl in the Midnight Gown features strong female characters is also very important to me personally. We want young readers to have characters they can look up to and be inspired by! Me: What inspirational words do you have for aspiring composers? Lehnert: Write something—as often as you can, if not every day! Even if you don’t end up using what you write in any project, even if it never ends up getting heard by anyone else, it at least gets you into the practice of writing, assessing and refining your work consistently. This is what you will be doing all the time when you work with a director or project lead. Learn how to create music using a digital audio workstation (DAW). There are some great ones out there—Cubase, Logic, ProTools, etc. (free options are Acoustica’s Mixcraft and Apple’s GarageBand)—and there are plenty of tutorials available on YouTube and Lynda.com to help you get started. Reach out to a school or university where film/video game studies are taught as a subject. 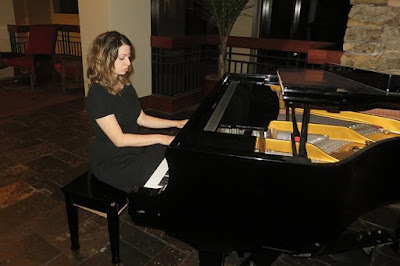 Chances are, students are looking for a composer to score their work. It will give you the chance to get your feet wet in this field and also make lasting contacts for future business opportunities. Me: You did some graphic design work on the illustrated story. Can you tell us what this entailed? Lyndon White: There’s an extra story that takes place after the comic, “The Unfinished Story,” which is a follow up to the main part of the book. This section of the book isn’t a comic and more of a traditional book with a few illustrations, drawn by Juan. I pieced together the pages with the text and Juan’s drawings. Me: Why was it decided to do an illustrated story in additional to the traditional graphic novel and release parts of it as the project was being funded? White: Story wise I think Simon had a bit more story to tell once the main narrative wrapped up. There’s also quite a lot of moving about and talking, which when translated to a comic would be a lot of talking heads in panels, which doesn’t always make the most exciting comic stories. 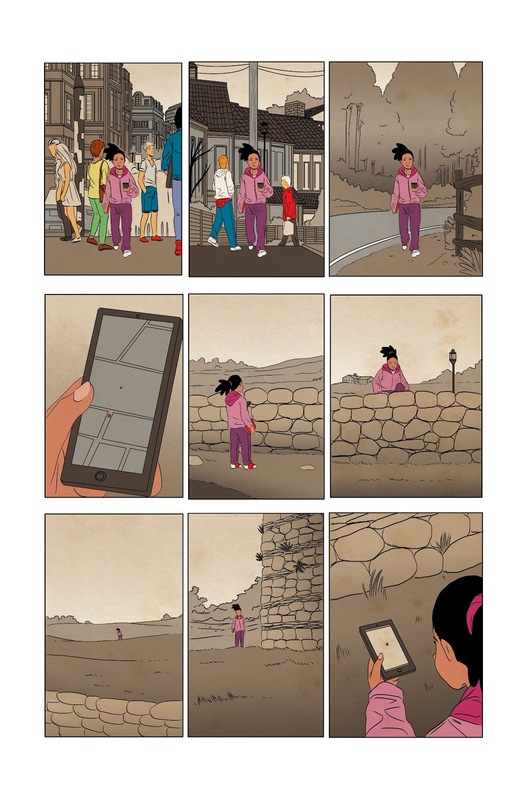 So having this part of an illustrated story worked to the strengths of the narrative. As for releasing parts as the project is funded, it simply helps when running a Kickstarter. It reminds people that there’s more to see and interact with the Kickstarter as it’s ongoing. If you’re someone who backed the Kickstarter on day one, normally you don’t look at the Kickstarter again until it’s finished, unless you’re looking out for updates. So having parts released at a time allows people to keep checking on how the Kickstarter is going and to also be actively involved in the campaign. It might sound a little silly, but more people will probably read it this way, than if the whole thing was available on day one. White: Blue Fox Comics actively uses Kickstarter a lot and that’s not a bad thing. It’s sort of becoming the new business model. Pay your artists and / or writers to finish the book and once it’s finished, put together a Kickstarter to get the money to print it. So the number one reason – please support us, pledge and we can keep supporting you. 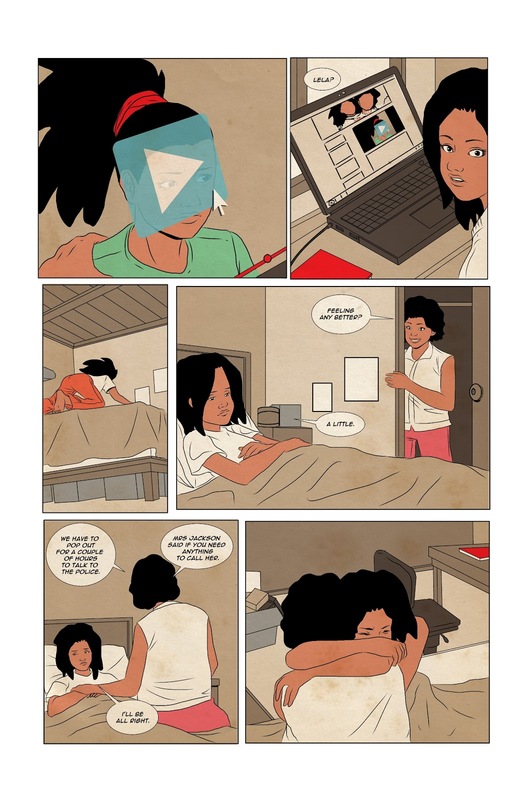 The more you support us and our Kickstarters, the more artists / writers are getting paid to make comics (which isn’t always easy in the indie comics world) and we can keep telling new, interesting stories for you guys to read. Me: What inspirational words do you have for aspiring artists and graphic designers? White: I got told to be a “T” designer when I was starting out. As in the “I” of the T, is your main body of work and the “—” line across the top is where you branch out. This might be something else now, but basically become multi-disciplined in your chosen field. For instance, my main body of work is comics / graphic novels. I spend 80% of my time making them, which is amazing. But that 20% includes children’s book illustration, general illustration, graphic design, writing, storyboarding, textile design, etc. This allows you to have more opportunities and gives you a broad skill set. Which if you’re working on comics is great because you can do it all, the pencils, inks, colours, text, cover, logo, etc. Even if you purely want to be a graphic designer, design for advertising, for logos, print and digital, it really helps you in the long run. You don’t have to do everything, just make sure you have enough tools in your kit. Me: Thanks for your time, everybody! 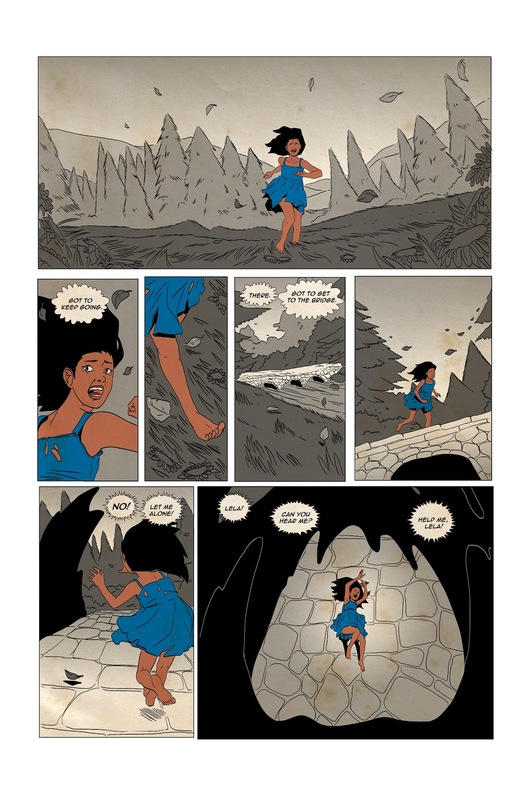 If you’re reading this and you want to check out The Girl in the Midnight Gown, view their Kickstarter here.